Capel Curig: Accommodation, Attractions, Activities, Going Out, Shopping, Things to Do, Places of Interest, Outdoors, Capel Curig Holidays, Capel Curig Area Location, North Wales. Capel Curig is a village in North East Snowdonia between the high mountains of Snowdon, the Glyders and the Carneddau and the Conwy Valley further East. There are a number of walking paths near Capel. Two popular are the walk North East to Trefriw and the riverside walk from Betws-y-coed via Swallow Falls. There are numerous attractions within easy reach, with Bangor, Caernarfon, Llanberis / Snowdon, Beddgelert, Porthmadog, Anglesey, Llandudno and Conwy. Walkers, climbers and mountain bikers are spoilt for choice with mountains, forests, and wooded valleys waiting to be explored; fishing is also popular here. Accommodation: from Hotels to Campsites. 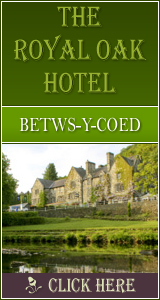 Tyn-y-Coed Hotel: perfectly positioned Accommodation in Capel Curig, close to Snowdonia National Park, North Wales. Accommodation and Tourist Guide for Snowdonia National Park: all you need to know about visiting Capel Curig. Local Walks, Heritage Walks, Accommodation, Eating Out, Outdoor Pursuits, Guides & Courses. Campsite between Capel Curig and Betws-y-Coed in the magnificent Snowdonia National Park is ideal for walkers and climbers. Gwern G�f Isaf Campsite Accommodation in the Snowdonia National Park.